The Robert Goldwater Library has been relaunched! This old blog shall remain as an archive of posts ca. 2005-2007. 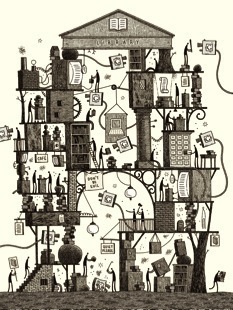 Anthony Grafton in this week's New Yorker provides a lucid and level-headed analysis of the many fervid efforts to digitize the universe of the printed word, such as the Google Library Project and Microsoft's Live Search Books Publishers Program, as well as more focused (and frequently non-profit) ventures such as the Open Content Alliance and more subject-focused efforts such as Aluka (about which you've previously read in this space). Google and Microsoft pursue their own interests, in ways that they think will generate income, and this has prompted a number of major libraries to work with the Open Content Alliance, a nonprofit book-digitizing venture. Many important books will remain untouched: Google, for example, has no immediate plans to scan books from the first couple of centuries of printing ... Other sectors of the world’s book production are not even catalogued and accessible on site, much less available for digitization. The materials from the poorest societies may not attract companies that rely on subscriptions or on advertising for cash flow. For now and for the foreseeable future, any serious reader will have to know how to travel down two very different roads simultaneously. No one should avoid the broad, smooth, and open road that leads through the screen. But if you want to know what one of Coleridge’s annotated books or an early “Spider-Man” comic really looks and feels like, or if you just want to read one of those millions of books which are being digitized, you still have to do it the old way, and you will have to for decades to come. Apart from the article, "Future reading: digitization and its discontents," there is a complementary online-only article with links to many of the web resources cited in the article. An interesting new development in the 'digitization' of books is reported in a recent post by BibliOdyssey, one of particular interest to our readers. 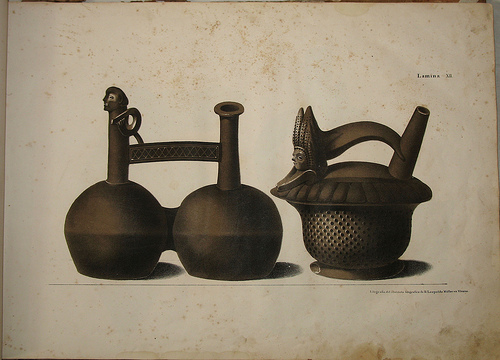 In the 1830s and 1840s, Peruvian museum curator Mariano Eduardo de Rivero and Swiss naturalist Dr Johann Jakob von Tschudi undertook a survey of all known relics, ruins, records, bones, artefacts and artworks relating to the pre-Columbian civilisations of Peru. 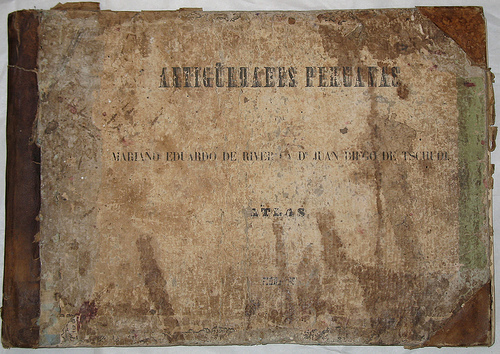 The resultant 1851 book, 'Antigüedades Peruanas', was a thorough and critical archaeological, ethnographic and anthropological review for its time, although their conclusions about, for instance, racial groupings have been superseded. A digitized version of the English-language translation (1855), which is less lavishly illustrated, is currently freely available through the Internet Archive. 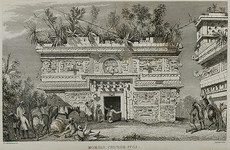 This carries on the continuing work of BibliOdyssey to highlight historic illustrations available on the web. Previous posts include portraits of Native North American chiefs, McKenney and Hall's History of the Indian Tribes of North America (1836-1844), Guaman Poma's Nueva Coronica y Buen Gobierno, and Captain James Cook's Voyage to the Pacific Ocean of 1784. Aluka, the online digital library of scholarly resources from and about Africa, announces the addition of The Ashanti Stool Histories, a valuable source for the social and political history of the Asante. The Ashanti Stool Histories, a two-volume, 1300-page collection, ... is a history of the political offices developed within the Asante state from its beginnings as an upstart confederacy in the late 17th century to its height as a formidable 19th-century empire with a complex bureaucratic government. It is also the history of the officeholders, bureaucrats, and civil servants who, through inheritance or by appointment, worked within the Asante government. The term ‘stool’ was coined by the British to describe the intricately carved wooden Asante seats that, to this day, serve as symbols of political office and ritual observance. Originally existing primarily in oral form, the histories of these offices were collected and translated by Joseph Agyeman-Duah and were compiled by K. Ampom Darkwa and B. C. Obaka. Containing a wealth of information on the structure of the Asante political system as well as the social history of the Asante people and their West African neighbours, this collection is indispensable for any Africanist anthropologist or historian and invaluable for any student of Asante history and culture. 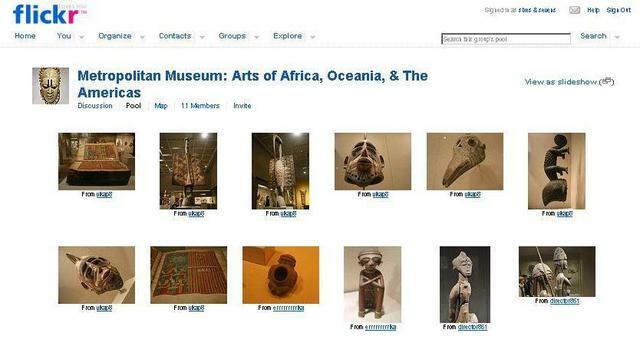 The Goldwater Library is pleased to announce its contribution to community-based photo sharing, Metropolitan Museum: Arts of Africa, Oceania, and the Americas. If you're reading this post, chances are you're already familiar with flickr, one of several social networking photo sharing tools on the Internet. The 'sharing' in photo sharing comes not only from adding photographs to the Internet for all to see. It also comes from contributing to other people's photos with notes, comments, and keywords or phrases, known as 'tags'. Albums (or 'sets' in flickr parlance) allow any member-contributors to assemble photographs by theme, event, or whatever concept they choose. 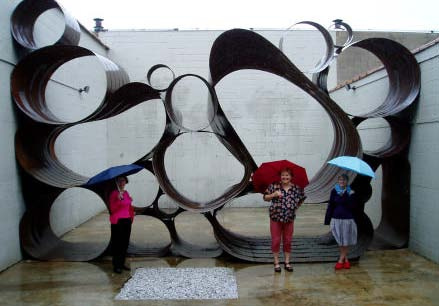 Similarly members can create a collective album, known as a 'group' or 'pool', to take advantage of other people's photographs by likewise gathering them under a single banner. It's this 'pool' concept that we're taking advantage of, a gathering together photos taken by visitors to the AAOA galleries -- the objects, the installation, the visitors, in short, the entire experience. An article some months back in Artnet reblogged in this space got us thinking about differences in the approach taken by art museums toward photography in their galleries. Art museums have had policies governing the taking of photographs in their galleries since indoor photography first became practical. 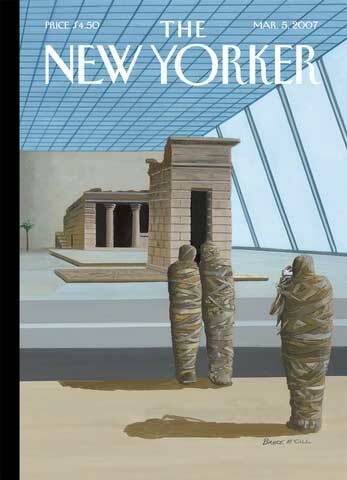 And when it comes to publishing photographs of museum objects, museums have created a cottage industry in selling rights and reproductions of objects in their collections. But the pervasiveness of digital photography and photo sharing websites (such as flickr) has significantly altered the equation. There's scarcely anywhere impervious to digital photo documentation. Family photographs, once relegated to shoe boxes or dusty albums, can now not only be readily retrieved but also relentless shared with everyone. In effect, the personal becomes not just public but universal. And amateur photography taken inside museums have long been a staple of travel albums. But why this particular project and why now? TIMBUKTU, Mali — Ismaël Diadié Haïdara held a treasure in his slender fingers that has somehow endured through 11 generations — a square of battered leather enclosing a history of the two branches of his family, one side reaching back to the Visigoths in Spain and the other to the ancient origins of the Songhai emperors who ruled this city at its zenith. The musty collection of fragile, crumbling pages, written in the florid Arabic script of the sixteenth century, is also this once forgotten outpost’s future. A surge of interest in ancient books, hidden for centuries in houses along Timbuktu’s dusty streets and in leather trunks in nomad camps, is raising hopes that Timbuktu — a city whose name has become a staccato synonym for nowhere — may once again claim a place at the intellectual heart of Africa. This ancient city, a prisoner of the relentless sands of the Sahara and a changing world that prized access to the sea over the grooves worn by camel hooves across the dunes, is on the verge of a renaissance. The South African government is building a new library for the institute, a state-of-the-art facility that will house, catalog and digitize tens of thousands of books and make their contents available, many for the first time, to researchers. 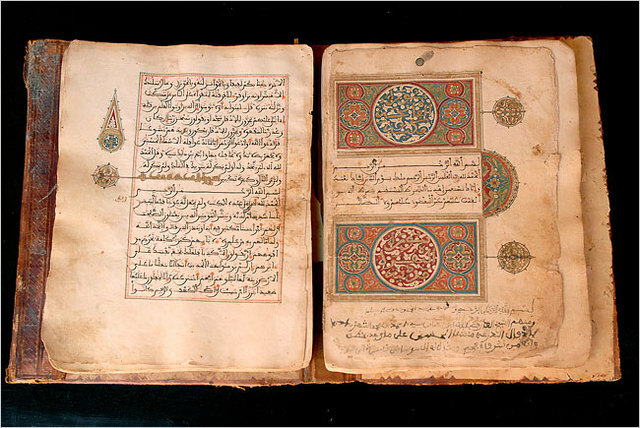 Charities and governments from Europe, the United States and the Middle East have poured hundreds of thousands of dollars into the city’s musty family libraries, which are being expanded and transformed into research institutions, drawing scholars from around the world eager to translate and interpret the long forgotten manuscripts. The Libyan government is planning to transform a dingy 40-room hotel into a luxurious 100-room resort, complete with Timbuktu’s only swimming pool and space to hold academic and religious conferences. Libya is also digging a new canal that will bring the Niger River to the edge of Timbuktu. Timbuktu’s new seekers have a variety of motives. South Africa and Libya are vying for influence on the African stage, each promoting its vision of a resurgent Africa. Spain has direct links to some of the history stored here, while American charities began giving money after Henry Louis Gates Jr., the Harvard professor of African studies, featured the manuscripts in a television documentary series in the late 1990s. ON A MUGGY DAY IN KIGALI IN 2003, some of the highest-ranking officials in the Rwandan government, including President Paul Kagame, flanked an American businessman, Greg Wyler, as he boldly described how he could help turn their small country into a hub of Internet activity. Mr. Wyler, an executive based in Boston who made his fortune during the tech boom, said he would lace Rwanda with fiber optic cables, connecting schools, government institutions and homes with low-cost, high-speed Internet service. Until that point, Mr. Wyler, 37, had never set foot in Africa — he was invited by a Rwandan government official he had met at a wedding. Mr. Wyler never expected to start a business there; he simply wanted to try to help the war-torn country. Even so, Mr. Wyler’s company, Terracom, was granted a contract to connect 300 schools to the Internet. Later, the company would buy 99 percent of the shares in Rwandatel, the country’s national telecommunications company, for $20 million. But after nearly four years, most of the benefits hailed by him and his company have failed to materialize, Rwandan officials say. “The bottom line is that he promised many things and didn’t deliver,” said Albert Butare, the country’s telecommunications minister. Mr. Wyler says he sees things quite differently, and he and Rwandan officials will probably never agree on why their joint venture has been so slow to get off the ground. But Terracom’s tale is more than a story about a business dispute in Rwanda. It is also emblematic of what can happen when good intentions run into the technical, political and business realities of Africa. Attempts to bring affordable high-speed Internet service to the masses have made little headway on the continent. 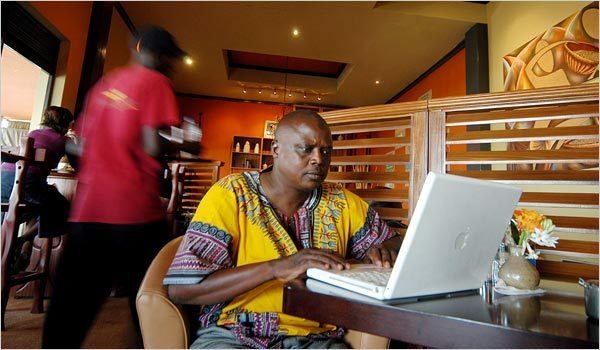 Less than 4 percent of Africa’s population is connected to the Web; most subscribers are in North African countries and the republic of South Africa. A lack of infrastructure is the biggest problem. In many countries, communications networks were destroyed during years of civil conflict, and continuing political instability deters governments or companies from investing in new systems. E-mail messages and phone calls sent from some African countries have to be routed through Britain, or even the United States, increasing expenses and delivery times. About 75 percent of African Internet traffic is routed this way and costs African countries billions of extra dollars each year that they would not incur if their infrastructure was up to speed. Africa’s only connection to the network of computers and fiber optic cables that are the Internet’s backbone is a $600 million undersea cable running from Portugal down the west coast of Africa. 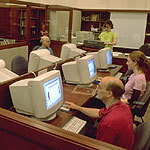 Built in 2002, the cable was supposed to provide cheaper and faster Web access, but so far that has not happened. Prices remain high because the national telecommunications linked to the cable maintain a monopoly over access, squeezing out potential competitors. And plans for a fiber optic cable along the East African coast have stalled over similar access issues. Most countries in Eastern Africa, like Rwanda, depend on slower satellite technology for Internet service. Museums in Libya 2.0: "lamusediffuse"
After several months of intense and exciting work, the project Museums in Libya 2.0 is already available on the Internet. * Finally, creating a reference document on the Libyan museums that will be published under a Creative Commons license of attribution and for noncommercial use. From now on you can enjoy the wonderful Libyan museums strolling through the interactive map, where you will find information on each museum provided by our collaborators and Social Web users. Do not forget also consulting our wiki and updating it with new data. 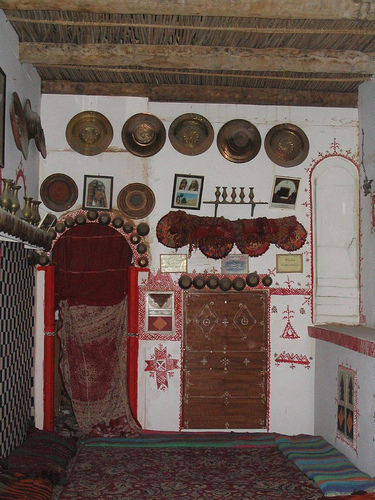 Besides, you can collaborate sharing your photos of Libyan museums including them in our group in Flickr, e-artcasting. At this moment we leave you with the presentation we have made to present the project on next July 11 at the Medialab of Madrid (Spain,) within the Inclusiva.net encounter: New Art Dynamics in Web 2 mode (http://www.inclusiva-net.org) In the meanwhile, you can consult the references of the project in lamusediffuse's del.icio.us account (http://del.icio.us/lamusediffuse/libya). We hope meeting some of you there!